To match the demand of greater accuracy and total reliability at higher speeds has specially developed VMC 40. This machine is a C type structure machine, with a moving table for easy access. The high dynamic structure supports rapid axes take-offs with an acceleration of 5m/s2. Hi-tech features like linear scale feedback and through coolant and 4th Axis are incorporated in this machine as available options. >> Job work with material. >> MS Bush Items,Brass bushes operations (turning and odi grinding). >> Motor body operations are Turning, Driling and Taping work type job work. >> MS shaft used for 2HP motor made of EN8 matriel operations. >> Bearing block made of SS410 material work type job work without material. >> Flange GE used for motor. 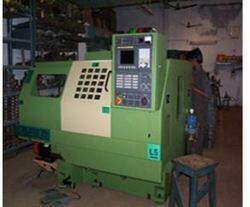 >> 4 Operators CNC turning. >> Helpers for packing and in cutting section 2 operators.